Apr 17, 2015 | By CENS | HANS TOOL INDUSTRIAL CO., LTD. Among many economic indicators, sales of heavy and medium-duty trucks in a country is perhaps one of the telltales of activity and growth in certain primary and secondary industries as manufacturing, extractive industries as mining and oil exploration, construction, trucking or shipping. With the American economy steadily on the mend over the past few years after President Obama Barack proposed the idea for American manufacturers to "re-shore" or return home to bring jobs back to the nation, overall sales of such trucks (Class 4-8 in the U.S. including trucks with gross vehicle weight rating ranging 6,351 kgs.-14,969 kgs) in North America showed a strong finish in 2014 and are expected to further grow in 2015, a trend likely to drive growth in demand for maintenance and repair services to benefit hand tool suppliers. According to a report issued by the National Automotive Dealers Association (NADA) from the U.S., annual sales of Class 4-8 trucks in the country totaled 406,747 units in 2014, representing a 15.6-percent increase over 2013 and the highest since the 544,581 delivered in 2006. The figure includes 111,384 units sold in Q4, significantly up 14.4 percent year-on-year. After brisk growth in 2014, the market is expected to keep expanding in 2015 by many market observers, including Business Wire, a global market analyst, who issued its latest report to predict overall output in North America and Next 11 markets, such as Europe, Brazil and Russia, to reach 2.88 million units this year, mainly led by persistently strong demand in the U.S.
Also, Americas Commercial Transportation Research, Co., LLC, a research and forecasting firm for the North American transportation market, cited the NADA's data to emphasize that a total of 65,700 units of Class 5-8 trucks in December of the year were booked to bode well for the market in 2015, when U.S.'s economy is generally forecast to grow by around 2.4 percent, thanks largely to surging housing starts and buoyant manufacturing industries, despite looming threats to shale gas suppliers who have been sapped by the so-called “Fracking Bust” caused by weak international prices of crude oil, not to mention shelved new exploration projects and layoffs by oil explorers whose costs are too high. Under the scenario, a handful of Taiwanese hand tool makers are eyeing the considerable business potential behind the bullish N.A. truck market, including Hans Tool Industrial Co., Ltd., a Taiwanese top-end branded supplier with sound reputation among professionals and DIY users worldwide. Hans's general manager M.H. Chang summed up the market by saying that the future for tool suppliers tapping the segment is certainly looking up, for trucks are crucial for a country's economy to be carriers of industrial, manufacturing goods, and require more extensive maintenance and repair services than passenger cars simply because they are typically exposed to some of the most rigorous conditions. 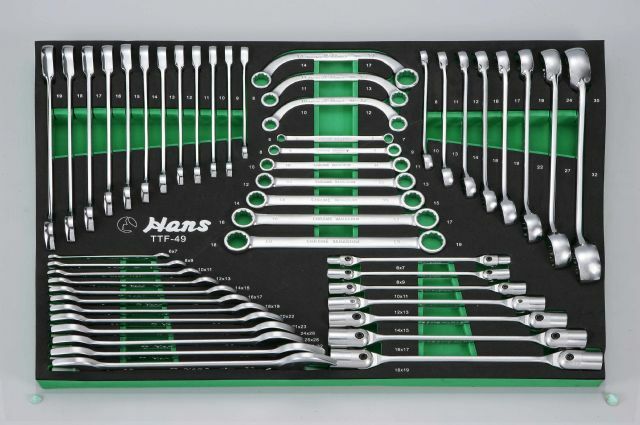 Hans's brand new hand tool set consists of 520 pieces of various tools and accessories for truck maintenance and repair. To explore such segment, Hans has just launched a brand new tool set specifically for maintaining and repairing trucks. 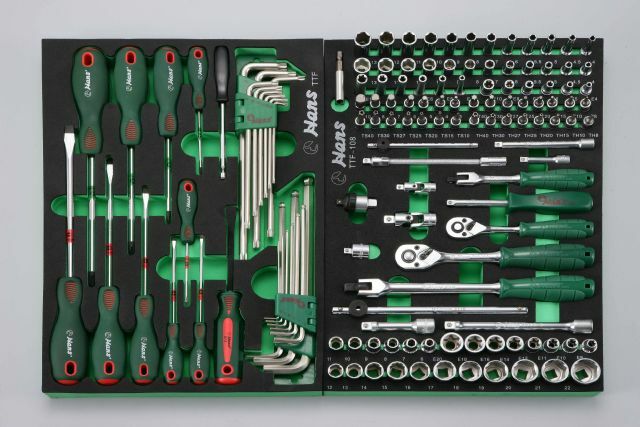 Chang introduced this tool set that comes in a roller cabinet and consists of 520 pieces of tools and accessories, with the tool combination and quantity able to be customized to meet different purposes. All the major tools in the set, such as sockets and torque wrenches, are exactingly made and finished to meet ASNI and DIN standards in terms of torque and structural durability, hence being suitable for removing and fastening large parts in the N.A. Class 4-8 trucks, which includes heavy-duty Ram pickups for tradesmen to Kenworths and Peterbilts. Chang added that the roller cabinet also features exceptional rigidity and structural strength, achieved by application of advanced jigs throughout production, a means that the young general manager stresses ensures the product is solidly fixed in place during each process to ensure optimal geometric engineering, which results in minimal dimensional deviation and maximum structural rigidity as expected during R&D. All the major tools in the set measure up to ANSI and DIN standards. 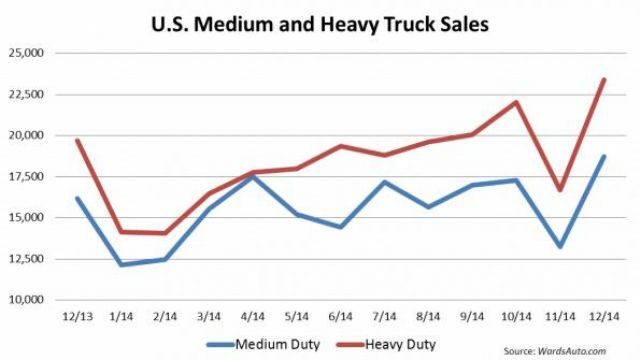 "Global demand for heavy- and medium-duty trucks is robust, but hand tool suppliers have generally overlooked the segment to rather focus on passenger cars. Therefore Hans has taken a different path by focusing on the niche market since having been inspired by a contracted agent in East Europe, where truck maintenance and repair services are increasingly needed," said Chang, who is optimistic that the newly launched tool set, which handles most parts in steering, chassis, brake and other systems of trucks, and has been proven practical for mechanics, will also help the firm to achieve bigger sales gains in the N.A. market. Synonymous with Top Quality Founded in 1973, Hans Tool has marketed products globally under the “Hans” brand for 40 years to have built a trustworthy name among professionals, buyers from the auto repair tool segment in Europe, the Middle East and Southeast Asia. Justifying using the eponymous brand, Chang said, "Hans is a typically German masculine name, so using it would help buyers associate our brand to top quality, which is usually a feature of German products." While Taiwanese hand tool manufacturers have generally succeeded with American buyers to be known as competent OEM (original equipment manufacturers), for Taiwanese brands have so far not been able to establish reputation and acceptance in markets, Chang is confident that Hans has the expertise to be a reliable partner for retailers and dealers interested in truck maintenance and repair tools, mostly due to its successful experience in branding and building positive relationships with agents and distributors worldwide. Another factor driving such confidence, Chang stated, is that Taiwan's hand tool industry began life and then rapid gestation when the U.S. army heavily outsourced supplies and tools from the island during the Vietnam War in the early-1970s, and this historical tie between the industry of both countries has inevitably set the mold to motivate Taiwanese suppliers to keep developing, improving hand tools to meet ANSI standards and preferences of American end-users. Tool combination of the set can be customized to meet different purposes. Chang finally said, "Hans has built its success mainly on taking the path less often traveled, in addition to commitment to quality, and the launch of our new tool sets in response to steadily growing market for trucks stateside is how we differentiate ourselves from competitors to create mutual profit for all those involved in our ventures."